Providing the North Orange County area with professional, fast and eco-friendly junk removal services. Now that the kids are back in school, you’re sure to be inundated with a whole list of “projects.” There will be science exhibits to construct, cookies to bake, uniforms to buy/wash and homework to help with. It’s all part of the fun of having a kid in school. This is your chance to relive you own school days! Although it was fun having the kids around all summer, you have to admit that you appreciate the quiet time now. This is your chance to get reorganized around the house and prepare for the coming holidays. Before you know it, the turkey will be going into the oven and the gifts will be going under the Christmas tree. Will you be ready? Junk King is the perfect company to hire to help declutter you home. With the kids in school, you have the opportunity to go room by room and decide what should be tossed out. 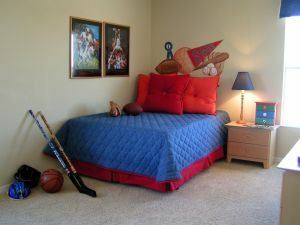 This could be a year of transition as the kids outgrow their old bedroom furniture. If storage space is limited around your home, it will be hard to hang onto that toddler furniture. On the other hand, if you want to keep it for sentimental reasons, then you can always make room by clearing out the other stuff. Either way, you’ll be glad that Junk King is part of the cleanup effort. With Junk King on the job, you’ll be utilizing a two-man moving a crew and a huge truck. The crew will be doing the actual junk removal and loading work. You only have to show them what you want taken away and it is as good as gone. That includes things you’re keeping stored down in the basement or up in the attic. Having access to a big moving truck means there won’t be any limit to what you can throw out. Junk King has help real estate agents with foreclosure cleanouts. Translations: they’ve hauled away an entire truckload of rubbish. Whether your junk pile is big or small, Junk King will make sure it is gone for good. In terms of pricing, you’ll find that Junk King is very affordable. When you consider all the service they provide and the time they save you, it really is the best deal in town. Call Junk King today to set up your junk removal appointment and watch how fast you home can be decluttered. This entry was posted in Anaheim Junk Removal and tagged back to school, Junk King, junk removal on September 30, 2014 by Junk King. Last updated July 31, 2017 .